This is a blog about design from my perspective as a person with autism (self-diagnosed with Nonverbal Learning Disability). I cover both design issues for users with ASD (Autism Spectrum Disorder), and particular designs I happen to like, while trying to give reasons why they may appeal to someone with autism. I’m not a professional designer, just someone who likes what he sees as good design. My perspective as a design-minded person with autism may be of interest to others (particularly those with ASD and anyone designing for them). 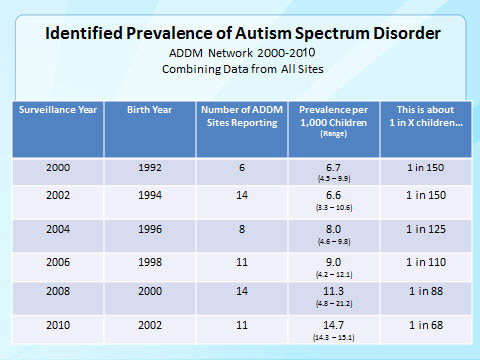 Any estimate of the ASD population is controversial, but according to the CDC about 1 in 68 children in the United States has been diagnosed with an Autism Spectrum Disorder, and the percentage has been rising (see chart below). That may seem a low percentage to some, but there’s a large overlap between the special needs of the ASD community and senior citizens (for instance, compared to the average person, many individuals in both groups tend to have poorer coordination, and are more easily confused by audio-visual stimuli). Add the ASD and Senior demographics together, and you have a large consumer base for designs specific to their shared needs. In addition, the percentage of persons aged 65 or older is projected to climb rapidly throughout the developed world. In many cases, the designer’s ‘typical user’ profile may need to be modified to account for the growing ASD-Seniors market share, and this can often be done without compromising the general appeal of the product. NOTE ON TERMINOLOGY: I was recently informed that some persons with autism object to the label ‘autistic’. I have therefore ceased to use the term in new posts. However, I lack time to remove it from old posts. I also re-blog other bloggers, and many of them use the word (re-blogged posts are not editable). I therefore hope for the reader’s kind understanding in both regards. Anxiety is a common accompaniment to autism, and can manifest itself as ‘choking’, under-performing when under pressure to achieve a goal. Examples include under-performing in an exam or job interview due to anxiety at not getting the grade or job you want, even though you had the potential. A new study suggests that you can perform better in such circumstances by thinking you’ve already achieved the goal, and are performing to keep it rather than get it. For example, in an job interview, you can assume that you have the job, and are being interviewed for the right to keep the job. In an exam, assume you already have the desired grade, and are taking the exam to keep the grade. Read more about the study here. I can’t touch type, and issues with hand-eye coordination or poor memory puts touch typing beyond the reach of many with ASD. So I end up looking down at the keyboard and up at the screen repeatedly, which puts a strain on the neck and back. It’s worse with a laptop, because the screen is usually below normal eye-level, so you’re constantly looking down, while jiggling your head up and down to glance at the keyboard. I found that raising the laptop and placing it at an angle helps to move the screen to eye level, with the keyboard just below. By propping up my forearms on a raised support in front of the keyboard, I found I could type comfortably with less strain. The Mobicase by Rovingwork makes it possible to adopt this position on the go. The laptop case has a mechanism that tilts the laptop to your preferred angle. Tying shoelaces can be a challenge to children with autism, and shoe-wearers of all kinds find it odd that we’re still fastening our shoes with bits of string in the 21st Century. Zubits has revolutionized the process with their magnetic closures, which you lace into once, and then fasten and unfasten with the magnetic buckle. They come in a variety of colors and work with any standard lace-up shoe. Negative thoughts are a recurring problem for anyone, but especially for many on the autism spectrum. Research has shown that keeping a daily record of positive things that happen to you (even small things) can help counter-balance negative thinking. In the video above from happierdotcom, Dr. Martin Seligman explains more about the Three Good Things Exercise.